By resigning her Rajya Sabha seat in a dramatic huff, Daulat Queen Mayawati could well have driven the final nail in BSP's coffin. Though only nine months remained in her term with no chances of her reelection, a politician always wants to make each day count, especially after an electoral holocaust. Resignations often reveal the acceptance of failure from within. Mayawati anyway was never known to be a crafty, stubborn or calculating politician like so many of her contemporaries. She was thriving for more than two decades on the legacy which Kanshi Ram took decades to build or on circumstances. Each term at the Chief Minister's office only added to her megalomania which bordered dictatorship. In 2007 Mayawati, rose to power on her own mainly because of the utter failure of Mulayam Singh Raj of 2002. Add to it circumstances in which upper castes mainly Brahmins felt alienated and had nowhere to go. Pushed to the wall, the upper castes led by Brahmins backed the BSP and a Dalit-UpperCates-Muslim combine gave Mayawati an unbelievable majority. But her five-year rule proved a huge let down for all those who brought her to power. Forget the Dalit, Upper Castes or Muslims supporters, who initially did bask in her reflected glory, even her senior ministers would need to take prior appointments to meet her. Industrialists withdrew from Uttar Pradesh and all development work came to a standstill. There were no interactions, no interviews with the media. Like any autocrat, she was scared for her life that her house and office were turned into a fortress. In fact, she rarely attended her office in the secretariat.She stopped touring the state and also avoided making public appearances. Probably the only visible achievement of her regime was the huge Roman structures all over Lucknow and some other select towns. Though beautiful and imposing to look at, these structures even today have no practical use. A good Rs 50,000 crores were spent on these unproductive monuments and huge kickbacks were pocketed in the process. Dalits did admire these grand structures initially as they attended BSP's rallies in Lucknow but they soon realised that stones don't have a heart. The buildings may massage their ego but cannot give them food and jobs. Corruption and nepotism ruled the roost in her five-year suffocating rule. As a result, even a disgraced Samajwadi Party, this time under the leadership of Akhilesh Yadav reaped a rich harvest in 2012. Despite predictions that Mayawati would return yet again, BSP was reduced to just 80 seats in 2012 from 206 seats. In 2014 Lok Sabha elections it could not even get a single seat. Now came the annihilation of 2017 assembly elections. The party was plagued with the exodus of senior party leaders, a process which continued even much after the election results came in. Mayawati this time attempted to play the Muslim card as she curtailed fielding Upper Caste candidates. The BSP won merely 19 seats with 22.2% vote share. It faced a loss of 61 seats over 2012. The party came to a full circle as this became its lowest score since 1991, its budding stage, when it won 12 seats. Reviving the BSP from here would once again need a Kanshi Ram. It is simply beyond an autocrat like Mayawati who treats everybody around her as scum. Even the part of Dalits - the chamars and Jatavs, who used to swear by her, have deserted. The Muslims have clearly signalled that they do not consider BSP as an alternative to BJP. Of the 100 Muslim candidates fielded by BSP, only two could win. Upper Castes have lost whatever little faith they had in Mayawati. The ride from here on seems going nowhere. 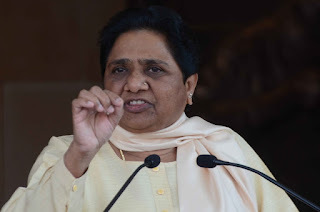 With most of the BSP stalwarts like RK Chowdhry, Swami Prasad Maurya, Naseemuddin Siddiqui gone, Mayawati sits all alone to preside over the end of Kanshi Ram's cherished dream - the BSP. 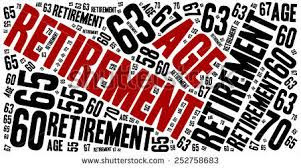 Let's start the argument all over again from the other side - why should you RETIRE? Cricket fans were stunned when Vijay Merchant, one of the greatest Indian openers announced his retirement after scoring his highest Test score In 1951. When journalists asked him the reason, he simply said,"You should hang your boots at a stage when people ask WHY rather than WHEN." But then Merchant was a professional sportsman. So many professionals in different fields have set such examples. We admire them but it ends there. We religiously keep following our leaders when it comes to our own retirement. For ages, our politicians have had this 'never-say-die' spirit when it has come to bowing out. We have been represented by ageing, tottering politicians of all caste and creed. Even in international forums, we have seen our 'netas' managing to reach the podium with infant-like wobbly demeanour or speaking as if it is going to be their last speech. We have seen ministers sleeping in meetings and on the stage. There have been only a paltry few whose public presence has made us proud. What do the khadi-clad tribe of this country do? If you make a mental sketch of an Indian 'neta', you would only come across a crafty living being. He does not have a worthwhile degree but he thrives on conning his followers and people at large by making false promises. He does not have any skills but he has mastered the art of manipulating elections for himself and his party. He does not get a salary in most cases but is an expert in filling his coffers through mostly unfair means. Catch him red-handed but he can wriggle out by blaming everything on his rivals. In most cases, it will impossible to add any positive attributes especially linked to productivity in that sketch. Still, he has the last laugh as he keeps coming in and out of power till he lives. We believe and follow our leaders. The haggling for retirement age often comes from quarters of average performers, who want to fill their bucket till the last drop trickles. In most such cases such an attitude stems from our zest to stick to our comfort zones whether you are an employee or an employer. The will to take new challenges and explore new horizons safely rests in the cocoon we build around our respective lives in the name of security. Today governments everywhere in the country stay torn in choosing between increasing retirement age and retrenchment. When the Finance department raises alarm over the staggering salary bills and also the ever-increasing perks and pension, the idea of chopping off the deadwood through compulsory retirement starts looking good. But it is high time that we first figure out the usefulness of the so-called administrative system we have made. We just have supervisors in the bureaucratic services and no executors. Howsoever important the issue may be, the government file is created by clerks and section head clerks. Bureaucrats only sign and counter-sign these files. Similarly, an FIR is even now investigated by an inspector or sub-inspector of police. The rest of the paraphernalia including SPs, IGs and DGs just supervise. In my 38 years of journalism, I have yet not come across a senior official who has himself constructed a file or a senior IPS official has solved a case of crime. Common sense would suggest the senior you become more is expected out of you. Can you expect a Virat Koli or Yuvraj Singh to sit back and leave the onus of performance on the younger players? You see an Amir Khan film even after so many years squarely for his performance. Linking jobs with performance and productivity can only keep you in business. 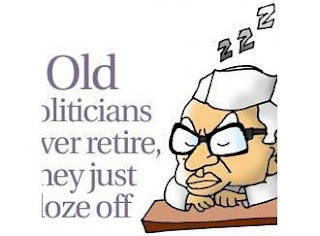 While governments discuss retirement age of its employees, the country needs to decide the retirement age of its politicians. If they can work till they die, so can everybody else. When should one retire? Answering this question is almost like projecting an appropriate age to die. In fact, one line of thought is that a salaried person dies twice - once when he retires and the last time when he actually does. In this country of not only multi-cultures, races, languages, cuisines, we also have a fair sprinkling of a multiplicity of rules and regulations. In fact in many cases, we do have two sets of rules as well - one for the mighty and powerful and the other for the lesser children of God. Even after 70 years of Independence, we have not been able to thrash out weeds and worms ailing our systems. But forget philosophy and emotions, let's stick to the brass tacks. New U.P.chief secretary Rajiv Kumar on July 6 ordered all departments to screen out officers and employees who have attained an age of 50 tears or more and who are "not fit" to perform their duties. Such screening should be complete by July 31 after which these employees will be "compulsorily" retired by giving them a three-month notice. On the same day, the Vice-chancellors of the state university held a meeting to recommend raising the retirement age for teachers from 62 to 65 years. The retirement age for doctors has already been raised to65 years. In certain institutes of excellence like the Sanjay Gandhi PGI, the age for retirement of Professor of Eminence has been made 75 years. Now the wait begins for some more ambitious government officials to grant themselves jobs till they die. The clause would read: "posted as ...... until death." A confused government is unable to decide whether to back experience or new talent. And how do you decide whether a person - a professional or a clerk, is unfit to work unless he has been declared so by the doctors on health grounds? This would lead to pick and choose and personal likes and dislikes will come into play. Instead, why can't we have firm rule fixing the retirement age so that the productivity of the employee remains the main criteria. This has been quite successfully practised in the private sector by the companies and also by professionals who know when to hang their boots. Who told Kapil Dev, Sachin Tendulkar, Narayan Moorthy (Infosys) or Rusi Modi and Cyrus Mistry (Tata) to resign. But then either the system or the individual has to be goal-driven. Unfortunately, in government frequent political changes keep uprooting and shifting the goal-post every now and then. Productivity is possibly the last of the priorities in a government official's serving tenure. Who has ever fixed the productivity of an IAS, IPS official or for that matter that of a clerk or a peon?